The daily reality of many early childhood educators involves adapting crafts and activities to suit children of different ages. Since daycare groups can include children at different developmental stages, we are forced to constantly adapt to children's individual capacities. If we are totally honest, this isn't always an easy task. Nonetheless, we want each child to succeed, learn, and have fun. After all, as early childhood educators, our main goal is to help children grow. Today, I want to make your life easier. I have prepared a simple craft that can be completed with a group of children of different ages. I have already identified the steps they can complete on their own, depending on their age. Trace a half-circle on a piece of construction paper. Cut it out and glue it on your 11 x 14 piece of paper. 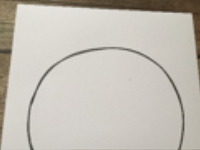 Draw a door in the centre of the half-circle, at the bottom. 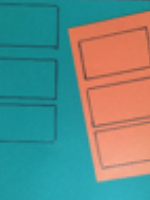 Draw several rectangles (different sizes) on construction paper. Cut them out. Trick: Draw thick outlines to make cutting the rectangles easier for little ones. Glue the rectangles inside the half-circle. Avoid gluing rectangles on the door. Color any white spaces between the rectangles. Next to your igloo, draw a stick figure or character. Draw several straight lines on a piece of construction paper and cut along these lines to create strips of paper. Cut these strips of paper into small pieces. Glue them around your igloo to represent falling snow. Add additional decorative items, if you wish. An adult must perform all cutting tasks. 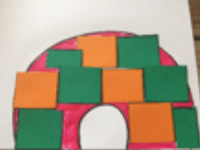 Let children glue the rectangles inside the half-circle. Give them the strips of paper and encourage them to tear them using their fingers. They can then glue the pieces of paper (snowflakes) around their igloo. What can 2 and 3-year-olds do? Cut the half-circle and all the rectangles for them. Encourage three-year-olds or children who are comfortable with cutting skills to cut 1 or 2 rectangles to provide them with the opportunity to experiment and work on their cutting skills. 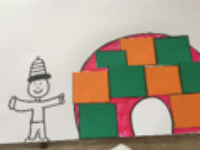 Let them glue the half-circle on the paper and build their igloo with the rectangles. They can also draw their own stick figure or character. The drawing will be very basic, that's perfectly normal at this stage. Children can cut their own strips of paper (a few centimetres). Cut each child's paper in half. Cutting shorter strips of paper will be easier for them. 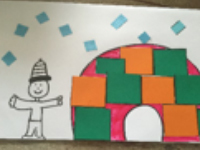 They can also cut their strips of paper into tiny pieces and glue them around their igloo. What can 3 and 4-year-olds do? Cut the half-circle and a few rectangles for each child. Let children cut out additional rectangles, but do not ask them to cut too many rectangles. You don't want them to get discouraged. Children can complete all the other steps independently. Provide help if necessary. They can complete the entire craft on their own!